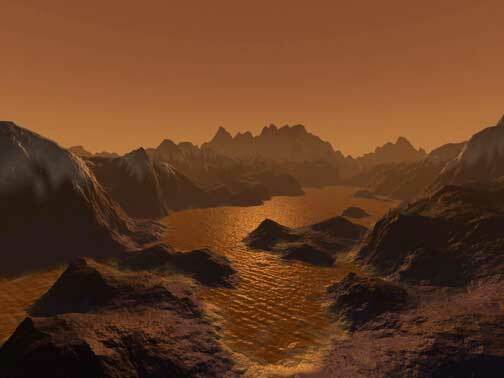 Artist's illustration of hydrocarbon pools, icy and rocky terrain on the surface of Saturn's largest moon Titan. Image credit: Steven Hobbs, Australia. February 13, 2008 Pasadena, California - Saturn's orange moon, Titan, has hundreds of times more liquid hydrocarbons than all the known oil and natural gas reserves on Earth, according to new data from NASA's Cassini spacecraft. The hydrocarbons rain from the sky, collecting in vast deposits that form lakes and dunes.